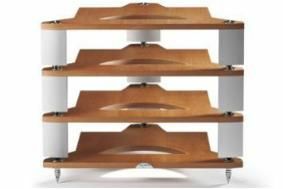 BRISTOL SHOW 2011: Naim launches FraimLite equipment supports | What Hi-Fi? FraimLite is said to be 'optimised for Naim's entry-level components', such as the XS range and the Classic line-up. The company says it brings the key benefits of Fraim while being more suited to smaller systems. FraimLite uses three adjustable floorspikes for levelling, and each level of the rack is decoupled from the one below it using a hardened steel cup and cone interface. Like the original, FraimLite is available in a modular form, with uprights in a choice of three lengths and either black or natural anodised finish, and shelving panels in ash, cherry or black real wood veneers. Prices start at £500 for a base and one level of shelving, with a twin-pack of add-on shelves also £500. A FraimLite system can later be upgraded to full Fraim specification if required.